Re we talking﻿ about﻿﻿﻿﻿﻿﻿ American﻿ pica's, French picas, or PostScript pica﻿﻿? This is something for very old people and then we also would like to have Didot Cicero. No, but we really need q! so the translatrion between traditional measurements is really unimportant, are only methods in an object or module or routine in the app. A US professional designer will find the lack of picas to be a show stopper. Typically we use computer picas 72 per inch. Your competitors both allow for setting a preference to use either computer picas (72/inch) or traditional picas (72.27/inch). For lack of a nail... the kingdom was lost. Yes it is that serious a deficiency! Looks to me like the Postscript pica. 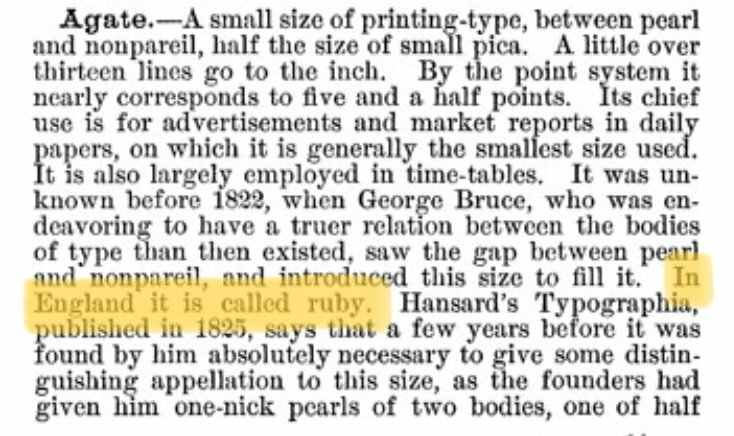 I think we are asking (at least I am) for the DTP point (desktop publishing point) which is defined as 1/72 of an international inch (about 0.353 mm) and, as with earlier American point sizes, is considered to be 1/12 of a pica. The pica measurement is so useful, because it corresponds so neatly with font sizes. 1p6 picas = 1/4 inch. 3p0 picas = 1/2 inch. 4p6 picas = 3/4 inch., 6p0 picas - 1 inch. But there are lovely permutations, such as 1p3, 1p6, 1p9, etc. Unit conversions include: 1 point in typographic units is equal to 1/12 picas; 1 point in imperial/US units is equal to 1/72 inch; 1 point in metric (SI units) is equal to 0.3528 mm. You are being so very nice about this. We have such high hopes!! I wasn't aware of there being different kinds of picas. The important thing to me is to have 12 points per pica. Whatever that is. We all thought you meant dollar pica. This is an interesting discussion, but I have to ask: "Why does unit of measure matter?" My point is that I use different units of measure for different things depending on what's most convenient. So why not let people measure stuff on a page in picas if that's what is good for them? Personally I've never measured anything in picas but there should be nothing stopping me from doing so if it seems right to do so for a particular purpose. For example even professionals get mixed up with pica, ppt, dd etc. which results in mistakes. For example in Europe, strictly speaking, you should only use/communicate the metric system. Perhaps Affinity apps could change the whole global difficult situation with different systems, font sizes etc. some day. For example there are fonts with the same name but they result in different sizes. AD seems to be the first “vector” app that uses x, c, and a. A great start to make things more accurate and easier. Serif did not really use this for marketing since 2016. And did Serif talk with ISO or DIN? You could make them an option or insert your own values? Correct GarryP, there is a benefit to using the units that are most suited to the job. We want this because we have learned through experience that it makes work faster and less fatiguing. The difference is so great that I vividly remember (from 30 years ago) the first time I changed ruler units in PageMaker to match the leading grid. I was working on a publication that I regularly produced and I thought I had gotten very fast with it, but customizing the ruler cut about 20% off the production time. What I remember most was my high energy level at the end of the day. It felt great! So in addition to picas, I suggest supporting custom ruler units, as can be set via preferences in InDesign. More than 2 years﻿﻿﻿﻿ … and still not a single pica, no dm, no Cicero, no Affinity Publisher. Any sign of agates? Or would they take affence? Any sign of agat﻿e﻿﻿﻿﻿s﻿﻿﻿﻿? Or would they take affence? Are you trying to ruby someone up the wrong way? Cool, Alfred. I never knew the different term. How about light-seconds while we are at it? 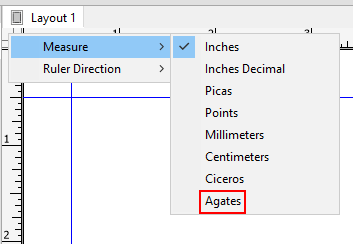 Right-clicking on the ruler to change measurements would certainly be nice. Custom measurement units a nice plus, but not sure how well the point/pica system would translate to that scheme unless custom formatting of the values was also provided for (12p3 may not be well-taken by a system that only expects a single numeric value to convert)?